During the winter of 1836-37, the Legislature passed an act authorizing the organization of Litchfield, appointing Samuel Riblet to preside over the first election, where there were 20 votes. There is some question as to how the community obtained its name, since the original name was to be Columbus. 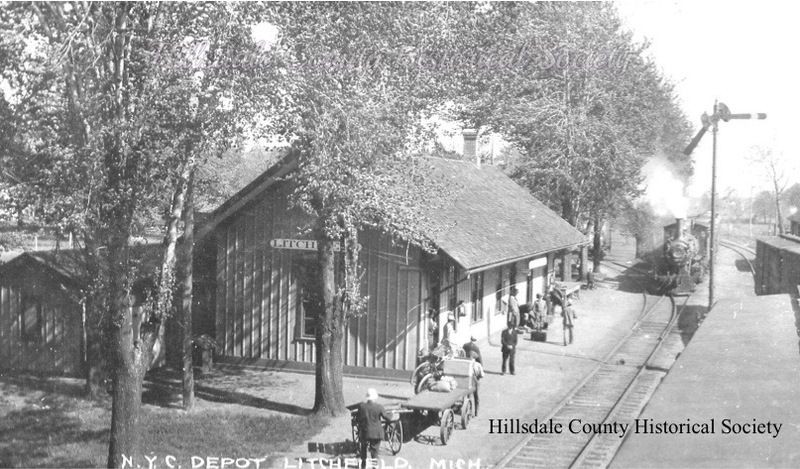 According to the 1879 History of Hillsdale County, Mr. Henry Stevens, "a turbulent man," who desired the name of Litchfield, went to Detroit where the Legislature was in session, and "by free use of liquid and other arguments prevailed on the Legislature to adopt that name." AUGUST STOCK WAS OVERSEER OF THE BUILDING OF STOCK’S MILL IN LITCHFIELD, BEGUN IN 1881. AUGUST DIED FOLLOWING A HORRIFIC ACCIDENT AT THE MILL IN HILLSDALE IN 1884. The st. joe river bridge near the mill. The New York Central Depot in Litchfield. The Litchfield Butter and Cheese Company started in this building in 1893. In 1910 it became known as the Litchfield Dairy Association and continued operations at this location until 1923. The new Creamery building located on South Chicago Street went into operation in December of 1923. The two large churns had a combined capacity of 2600 lbs. with a potential of making five tons of butter during a ten hour day. The Mill was built in 1880 by Frederick W. Stock of Hillsdale. The Mill is still in operation today under the name of the Litchfield Grain Company. Frank Walters is the current owner. William Simpson, in one of his autos from his sale room. William and his son, Robert, were pioneers in the auto industry. Over the years their generosity and interest in the area have proved to be very beneficial to Litchfield. The Sand Creek School opened in the fall of 1866 with Phoebe Aldrich as the first teacher. It was moved in March of 1989 to its present location on Mill Street and serves as the headquarters for the Litchfield Area Historical Society and Museum. Litchfield High School - This three-story brick building was build in 1889 at a cost of $12,000 to the school district. It served as a place of instruction until 1970 when it was demolished in preparation for the much-ended renovations in the the 1929 addition. The first Business meeting of the Congregational Church was held in 1839 and its first church was built in 1841. The present building was finished in 1872 and has served its membership well. The Methodist Church was dedicated in 1866 with Rev. John Clumbine as pastor. This structure was remodeled several times and served well as a house of worship until March of 1974. This building was razed in preparation for the new brick edifice. Stone Bee for the Baptist Church - In May of 1912 the businessmen of Litchfield joined together to raw over 80 loads of field stone for the construction of the new Baptist Church. Overall, nearly 300 loads were needed for its completion. The First Baptist Church was dedicated in April of 1913. The stone used for its construction was provided from several “stone bees” sponsored by the local farmers and businessmen. W.H. Fowler of Reading was the general contractor and builder. The “Bell in the Park” is a memorial to Rose Hartwick Thorpe, the author of “Curfew Shall Not Ring Tonight.” The bell was dedicated in 1934 during Litchfield’s Centennial Celebration. According to Chuck Lindsley, two of the rapscallions who put the car on top of the building were his dad, Merritt Lindsley, and Merrill Swope. 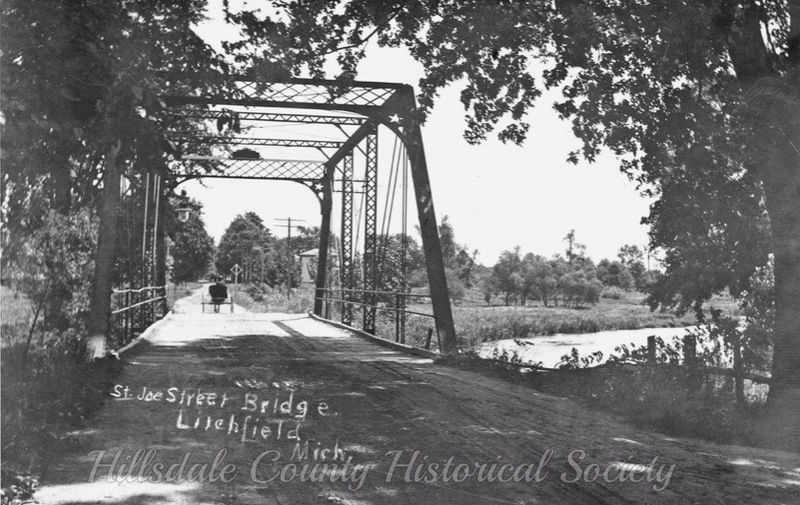 The Lindsleys reportedly came to Hillsdale County in 1850. Ingenuity and strong backs were used by the local pranksters to place “Old Timothy” on the roof of the Kennebrook building for Halloween. It took Bob Simpson and the city fathers three days to figure out how to get the auto back down to solid ground. "The bell that is shown in a picture from Litchfield was the fire bell. The town fathers were going to move it. Merritt Lindsley and others stole the bell until they received assurance that it would not be removed. Fifty years later, a man named George Seymour, dad, and I were in Canada fishing. George had been a rookie State Trooper assigned to the Jonesville Post. They were discussing old Litchfield when George blurted out, "You're the sun of a gun who stole the bell, aren't you? I was on that case." Dad confessed, they laughed, and had another drink."